It?s that time again, bunch of new stuff to talk about. NATS is upon us?.after waiting all year with baited breath, its IPMS National Convention time! These things are great?.renew old friendships, shop, meet new friends, gawk at some outstanding models?did I mention shop? We have been stoked about this for months. We are vending this year?.camped out with Brian Plescia from Fightertown Decals, and our little area includes Shawn Hull Resins and Jake Melampy will be there hawking his terrific line of books?.its a one-stop-shop. If you are attending, please make it a point to drop by and say hey and shoot the breeze. We love hearing from you guys and the shows are a great place to put faces with names. All the new stuff will be there and we?ll have some sneak peeks at some upcoming projects. We are going to be shut down between August 5th and the 10th while I?m out of town for the NATS. If you have an immediate problem, I?ll be on my cell and checking mail regularly. Speaking of new stuff?..hey we have new stuff! When Eduard announced a while back that they were working on a new family of F-4s in 1/48 from Eduard, we thought it would be prudent to dip our toes into the Phantom pool and start preparing for the remarkable rhino. When I've said in the past that if you have a subject you are passionate about, collect the reference and send it in....I wasn't kidding. This is a terrific example. Ben Brown is a 4th FW enthusiast, and a Phantom lover, so he set out to collect as much reference as he could on a subject near and dear to him, and we have 2 new sheets as a result! He tracked down pilots, crew chiefs and many many pictures, and really laid it out for us. It?s tough for us to be expert enough to do a decal sheet on as many things as we take requests for, but Ben made it easy. We're all the beneficiaries of his desire for this subject, 'cause they are COOL! 48-040 covers the Hill gray schemes from the 4th FW in the late 80s. It features a gorgeous wing king jet, and the COs jets for both the 334th and 335th FS, plus a couple of line birds. It?s tough to find a better looking jet than a Hill scheme F-4E... they are just classic! Stencils and walkways for 2 jets included. 48-041 is the continuation of the first sheet....we ended up with SO much cool reference that it was going to be impossible to limit the scope of the release to 5 or 6 jets, plus the differences in stencils between the Hill schemes and the earlier Euro I and SEA schemes from the early 80s, so we split 'em up. 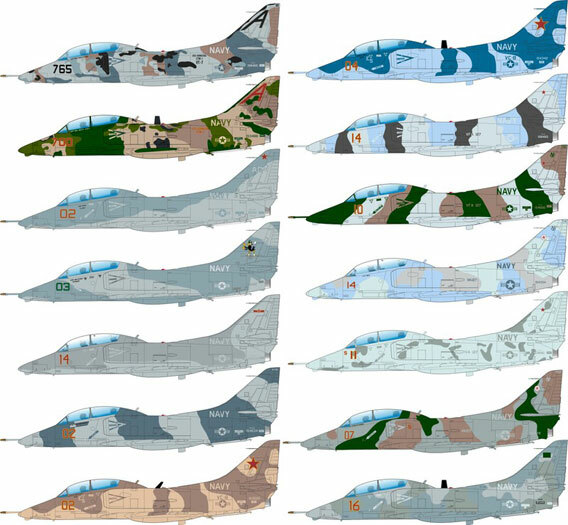 This sheet covers those jets and features a Euro I wrap scheme wing jet, a gorgeous Gunsmoke '85 jet with the GS badge and travel pod markings, CO jets from the 337th and 336th in lizard wrap, PLUS an SEA wrap scheme wing jet, and 2 jets from an '81 Red Flag with rudder markings. Little IPMS tie in here, also included is the SEA wrap scheme jet of IPMS Tidewater president Bob Dedmon from....a LOOONG time ago! Something for all us Double Ugly nuts, and believe me when I tell you, this is not nearly the last of this subject....we've just scratched the surface of 70s and 80s F-4s, and not all are going to be US either. Now, on to the scooters! With the release of Classic Airframes' new 1/48 TA-4J Skyhawk kit, the opportunity arose to indulge some lingering scooter lust, so we did just precisely that. We consulted some of the finest A-4 minds in the business, and here you go....3 of the coolest scooter sheets you are likely to find. 48-037 and 48-038 cover aggressor aircraft from a variety of units and a variety of eras, including 'Duke' Cunningham's jet from VF-126 and another 126 jet painted to resemble a MiG-17. There is something here for anybody who loves adversary scooters! A total of 15 jets covered over 2 sheets. Full painting instructions, and FS color matched markings combine to push the level of what you can achieve with a set of decals to new heights. 48-039 covers trainers.....and these things are just awesome! Hardly anything in naval aviation evokes the emotion of a white and orange skyhawk....it just exudes 'wings of gold'. This is the first of what will eventually become the ultimate collection of TA-4J/F markings available anywhere. This release features a variety of superb looking birds, from the classic white and orange jets, the VERY cool sinister overall dark gray ones to the gorgeous all metallic blue 75th Anniversary of Naval Aviation scheme....something here for everybody! Trainer sheet #2 is WELL into production, and bandit sheets 3 thru.....who knows, are in development. As always, you folks are always terrific to us, and as long as y?all keep buyin? ?em, we?ll keep makin? ?em! Afterburner Decals are available online from their website.